The Remhoogte Honeybunch Chenin Blanc 2016 comes from a 30-year-old block on this Stellenbosch farm, the well-established root system apparently sustaining the vines through the warm and dry conditions that prevailed during this particular growing season. 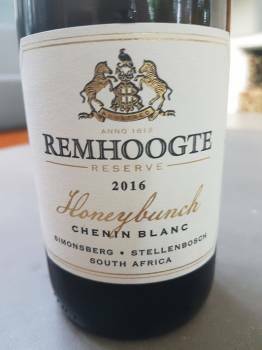 In the cellar, there was 12 hours of skin maceration before pressing, then spontaneous fermentation and 12 months of maturation in 225-litre barrels, 20% new. On the nose, hay, citrus and stone fruit, some spice plus a hint of leesy complexity. The palate is full but balanced with a particularly lovely acidity. The finish, meanwhile, is long and salty. Top notch. Price: R195 a bottle.